Muhammad Asim Khan, MD is the chief consultant for this website. He is a Professor of Medicine (with full tenure) at Case Western Reserve University (CWRU) in Cleveland, Ohio. He received his medical degree in Lahore, Pakistan in 1965, and after serving in the Army he began his postgraduate training in England in 1967 and later continued that in the United States. 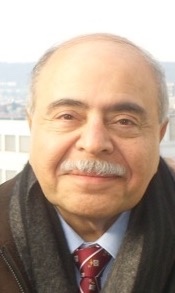 He joined the faculty of CWRU In 1973 after completing his Rheumatology Fellowship at CWRU at MetroHealth Medical Center. His research interests primarily focus on ankylosing spondylitis and related diseases grouped under the term spondyloarthropathies, and the role of genes such as HLA-B27 in predisposition to rheumatic diseases. He has authored 2 books, 45 book chapters, 210 scientific articles and 125 abstracts, and edited 13 yearly reviews and monographs. 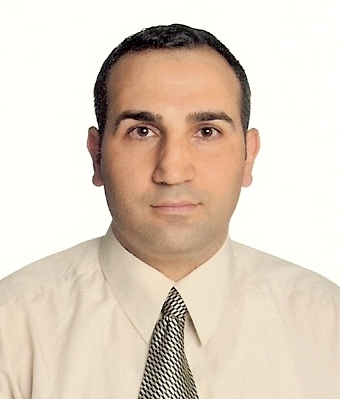 He serves as a Section Editor for Current Rheumatology Reports. Dr. Khan served as a member of the National Advisory Board for the National Institute of Arthritis and Musculoskeletal and Skin Disorders(NIAMS) from 1992 to 1995. He has also served on other medical advisory boards and as consultant and speaker for pharmaceutical industry. He is a frequently invited speaker at national and international scientific meetings, and has also earned the recognition of the medical community by being listed in Best Doctors in America as a specialist in Rheumatology. Dr. Khan is one of the founding members of ASAS (Assessment in Spondyloarthritis International Society), SPARTAN (Spondyloarthritis Research & Treatment Network), and GRAPPA (Group for Research and Assessment of Psoriasis and Psoriatic Arthritis). A Lifetime of Dedication and Devotion to People with Spondylitis Award from the Spondylitis Association of America in 1998, and in 2005 he became the first recipient of their Greg Field Award that is given to ‘individuals with AS who have persevered and gone on to be of service to others. As physicians, we come to know many daily accounts of pain and suffering experienced by our patients, but it is not easy for us to truly comprehend their plight, and how their illness can negatively impact many aspects of their lives. However, we ourselves are not immune from illness and therefore do face circumstances that lead us to experience what it is like to be a patient. I myself have suffered from severe form of ankylosing spondylitis (AS), a chronic, potentially disabling rheumatic disease, for 55 years [1-3]. I have faced the daily challenges of living with illness, and pursuing my professional and academic responsibilities as a physician for more than 45 years [1-2]. Not surprisingly, my primary research interests include AS and related forms of arthritis [1-3]. It is from this perspective that I convey my feelings through my self-portrait [4,5]. I painted it in acrylic in 1987; it took me 6 months to first conceptualize it in my mind and then 6 weeks to finish it. It is not easy to fully explain in words all that goes into forming such an artwork. 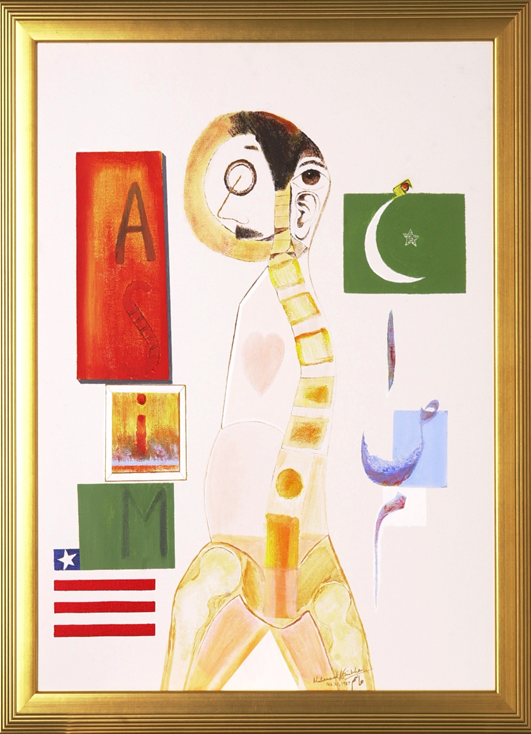 Just to explain to the viewer its major aspects in simplest terms, this painting is subdivided into three vertical components or columns that convey different themes, each utilizing my middle name - ASIM. The first two letters “A” and “S” in the column on the left represent my illness - Ankylosing Spondylitis, and the four letters together convey “AS I’M”, i.e., ‘AS I am’. The red color in the background of AS indicates the inflammatory nature of this disease, and the letter “S” conveys the spinal curvature and fusion. The inflammatory nature of AS is also conveyed by the letter “i” that looks like a burning candle. The letter “M” with its green background indicates that I am a Muslim. The letters “i” and “M”, and an abbreviated version of the United States flag (I did not have ample time, as a busy physician, to make 50 stars and 13 stripes) indicate my ‘immigration’ to the U.S. The middle column utilizes these four letters in lowercase (asim) to create my profile in such a way as to convey my agility and vitality. The first letter “a” forms almost a halo around the head, and my moustache, nose and ear are drawn quite realistically. Incidentally, it so happened that in later years I did have to wear a surgical halo for 9 months to treat my neck fracture. Please note that, back in 1987, my moustache and balding head had no gray hair. The eye is transposed to the side of the head to convey my inability to turn my neck since a laterally placed eye would have compensated for the limited field of vision. The next two letters “s” and “i” form my fusing spine, and the last letter “m” forms the pelvis with bilateral hip joint replacements. The heart in the fused thoracic cage is drawn in a clean and transparent manner to indicate my straightforward nature. The vertical column on the right side consists of the four Arabic letters - ‘ayin, alif, suad and meem - that comprise my middle name. These letters are written from above down in their solitary (non-cursive) forms. The first letter - ‘ayin - is written to also convey a white crescent, and it has a green background that has a star in the middle to depict the flag of the country where I grew up, and also to represent my faith, a religion of peace, justice and equality. Please note how faded that star is when compared to the one on the U.S. flag in the left column to convey the unfortunate situation the Muslims have been in during my whole lifetime, although they comprise at least one-fifth of the humanity. The shape of the second letter indicates my upright and straightforward nature, and the third letter appears to be floating and trying to keep its head above the water, even though some of the water has spilled over into its cup-shaped component. This signifies that we all struggle in our lives (to keep the “head above the water”) and overcome many hardships in our daily struggles to pursue honest, happy, peaceful and productive lives. The fourth letter happens to resemble the femoral prostheses and is shown imbedded in white cement to indicate my bilateral hip joint replacements. 1. Khan MA. Patient-doctor. Ann Intern Med. 2000;133: 233-235. 2. Khan MA: ANKYLOSING SPONDYLITIS. Oxford University Press, New York, NY. 2009; pp. 1-147. 3. Khan MA. Update on Spondyloarthropathies. Ann Intern Med. 2002;136: 896-907. 4. Khan MA. My self-portrait. Clin Rheumatol. 2001;20: 1-2. 5. Khan MA. The perspective of two paintings by a patient-physician. Journal of Medicine & The Person. 2005 (May);3( No. 2): 83-84.